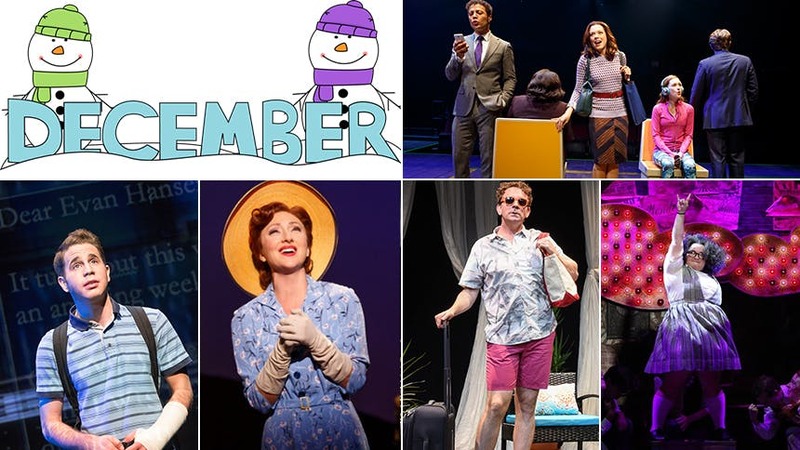 If you cut out closing shows you want to see again and holiday-themed extravaganzas, these are the five shows you should ask Santa to see. 1. Looking for something new and unexpected this month? Check out In Transit. The completely original, all a cappella musical follows the interconnected lives of a group of modern day Manhattanites. You aren’t even ready for Moya Angela in a Metrocard dress belting for the gods. It’s BEYOND. Running at the Circle in the Square Theatre. 2. Need a good cathartic cry? Head over to the the Music Box Theatre for Dear Evan Hansen. The musical does not disappoint—the buzz is totally warranted here. With a stunning book and anchor performances from Ben Platt & Rachel Bay Jones, this powerful show is readying to take NYC by storm. 3. Two of the hottest concerts of the month are both happening on December 12. First, the cast of the gone-too-soon musical Bright Star come together at Town Hall for a reunion concert and Q&A. If you missed the show, this is your one chance to experience even a sliver of that magic live. Also that evening at Studio 54, Roundabout presents Kelli O’Hara, Will Chase, Helene Yorke, & Robert Fairchild in the one-night-only benefit concert of Kiss Me, Kate. A star-studded musical concert like this is how the recent She Loves Me revival began, so…fingers crossed. 4. You don’t want to put off going downtown to see MCC Theater’s dark, smart new musical Ride the Cyclone, because if this is the end of the ride, you will have missed something special. The young cast is slaying the MF house down. It’s hard to pick a favorite in this bunch of teenage misfits all vying to come back to life after their sudden death—think Glee characters in the theme of Cats. It’s a reminder that off-Broadway musicals can be weird and cool and don’t always have to operate under the assumption that off-Broadway is a springboard to Broadway. Running at the Lucille Lortel Theater through December 29. 5. Drew Droege is back in NYC by popular demand with a return engagement of the acclaimed solo show Bright Colors and Bold Patterns. The play about a wedding in Palm Springs hilariously but thoughtfully explores what the LGBT community lost and gained in the struggle for equality, mainstream acceptance, and gay marriage. It's an especially interesting topic post-election. Running December 15-December 30 at the Barrow Street Theatre. Hot Clip of the Day: Bette Midler Remembers Those She Lost to AIDS with "In My Life" & "Friends"